General Description: A deep-rooted perennial herb, perennial sowthistle has upright, hollow stems with bitter, milky juice. Flower Description: Flowerheads are bright yellow and 1.5 inches wide. Flowers open 2 to 3 hours after sunrise and close around noon. Bracts at the base of flowerheads are green, bristly and have sticky hairs. Leaf Description: Leaves are alternate with prickly edges and pointed lobes and varying in size. Leaves become smaller and less lobed moving up the stem. Stem Description: Hollow stems are 1.5 feet to 6 feet tall, branch only at the top of the plant and have a milky juice. Fruit/Seed Description: Seeds are small, around 0.1 inches long with ridges on each side. Perennial sowthistle is classified as a noxious weed in many states and provinces. It is a problem in several crops where it causes economic losses due to reduced crop yields, increased cultivation and herbicide expenses and land depreciation. 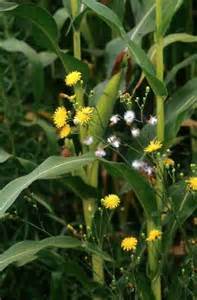 Perennial sowthistle was changed from a Class B to a Class C noxious weed in 2013.